One of the most important things you have to do to keep your turtle healthy and happy is keep the water in its tank clean and fresh. This is also one of the things that will make you proudest of your turtle habitat: When people look at it and say, "Wow, I can't believe how clear the water is!" Keeping the water clear isn't as easy as most people think, though. Turtles are messy animals, and they don't clean up their rooms no matter how many times they're told! So its up to us, their human keepers, to keep their habitats clean, fresh, and healthy. The most important thing to remember about the water in your turtle's habitat is that turtles eat, drink, swim, defecate (poop) and urinate (pee) in the same water. That makes it get dirty very quickly. If we don't keep up with it, your turtle's water will very quickly get dirty and smelly, and your turtles will become ill. Maintaining water quality in an aquatic turtle's habitat takes only a few hours every week if it's done properly. Here are the most important things you need to do to maintain a healthy water environment for your aquatic turtle. If your turtle's tank is too small, it will be much harder to keep clean. Turtles poop a lot, and if their tank is too small, it will get dirty a lot faster. Also, aquatic turtles like to swim, and a too-small tank won't give them enough swimming room to get enough exercise to stay healthy. In addition, turtles generate a lot of ammonia, which is toxic to them. The filter of a turtle habitat is what filters the ammonia out of the water using something called biological filtration, which means that "friendly" bacteria colonize the filter and digest the ammonia. But if there's not enough water, the concentration of ammonia can become very high, and your turtles may become sick or even die. We'll talk more about turtle tank filters here, and more about the way friendly bacteria keep your turtle's water clean here. You should read both of those pages before setting up your turtle habitat or buying a tank or any other equipment. Have you ever heard of a "rule of thumb?" Well, turtle keepers have a rule of shell! 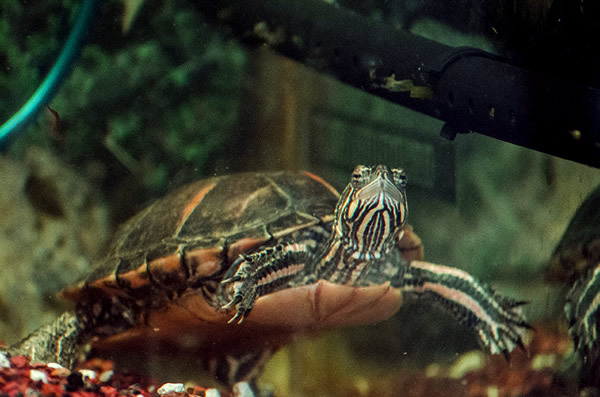 One way to determine how big a tank you need for your turtles is that for every inch of carapace (upper shell) length, your tank should hold a minimum of approximately ten gallons of water. So if your turtle's carapace is two inches long, your habitat should hold at least twenty gallons of water. If it's four inches long, the habitat should hold at least forty gallons of water. By the way, for our visitors from outside the United States, the "rule of shell" comes out to roughly 38 liters of water per 2.5 centimeters of shell length in metric measurements. That's not too easy to remember, so let's just say 15.2 liters of water per centimeter of turtle. So for a 13 cm turtle, you should have at least 197.6 liters of water (13 centimeters x 15.2 liters). If there are more than one turtle, size your tank for the first turtle, and then add half again as much for each additional turtle. So if you have two five-inch turtles, for example, your tank should hold a minimum of 75 gallons of water: 50 gallons for the first turtle, and another 25 gallons (half of 50) for the second turtle. Unless you plan to upgrade your tank as your turtles grow, size it based on your turtles' adult sizes. They do grow on you, you know. Of course, not everyone has enough space (or money) for a tank that big. If your tank is a little smaller than what's recommended above, your turtles will probably be okay. But you'll have to work a bit harder to keep the tank clean. Smaller tanks are harder to keep clean and healthy than bigger ones are, so try to use the biggest tank you can. The water filter is such an important part of a turtle habitat that I've moved the turtle tank filter information to its own page. 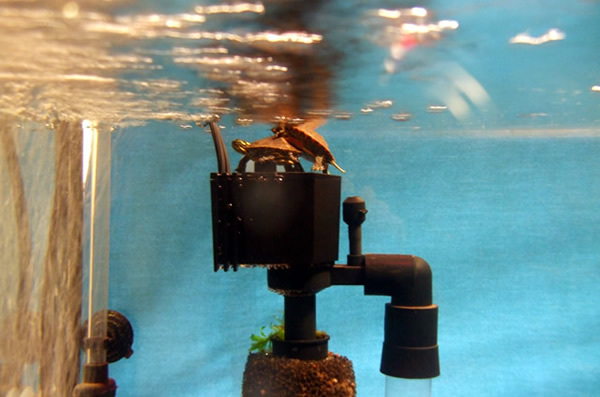 Please click here to read about turtle tank filters. Please read that page before you get a filter for your turtle tank. If there is food left over after your turtles finish eating, it will quickly begin to decay and will cause the water in your turtle tank to foul. So clean up any leftovers quickly with a net and throw them out. Another idea is to feed your turtle in a separate tank from the one they live in. But remember that aquatic turtles have to be in the water to eat because most turtles can't produce saliva. You can also use a large bucket to feed very messy foods like fish to your turtle. If you time the feeding of messy foods to happen at the same time as a water change (we'll talk about water changes further down the page), you can feed the turtle in the water that you removed from the tank; and then discard the leftovers with the water when the turtle is done eating. It's very important to vacuum your turtle habitat frequently, especially if you are using a substrate. You can use an inexpensive aquarium vacuum cleaner for this. Put the end of the hose in a bucket, and use the nozzle to vacuum the tank; this way you're doing a partial water change every time you vacuum. My favorite tool for this particular chore is the Python Aquarium Maintenance System because it has water faucet adapters that allow it to be used to add or remove water from the tank, in addition to vacuuming it. It sure beats carrying buckets of water through the house, especially if you have a large tank (or a large house). When using any siphon-type vacuum cleaner, never start the siphon using your mouth. Turtle tanks often harbor the bacteria that cause salmonella. It doesn't affect the turtles, but it makes humans sick. Use the squeeze bulb built into the siphon. That's what it's there for. Just on case you've never used a siphon before, make sure to have a big enough bucket on the outflow end of the siphon hose. Once the water starts flowing, it will keep flowing all by itself because water seeks its own level. That also means that you can stop the water flow by raising the outflow end of the siphon above the water level in the tank. Just cover the end of the hose with your thumb, lift it up higher than the water level in the tank, release your thumb, and let the water drain back into the tank. Turtles are not quite as sensitive to chemical changes as fish are, but you should monitor at least the water's pH, ammonia, and nitrite / nitrate levels. You'll need an aquarium water test kit for the type of habitat you're keeping (freshwater or saltwater). Read and follow the instructions very carefully or you may get inaccurate results. You can also use aquarium water test strips, which are easier to use than a water test kit, but not quite as accurate. There's a lot of chemistry behind aquatic habitat water quality. We'll talk about it in a bit more detail on this page about turtle tank water cycling. For now, the following numbers are what you need to know. A nitrate level of 40 ppm or less. If your tank's chemical levels meet all those requirements, your turtles should be pretty happy with the water. If you also have fish in the tank, however, you will need to follow the stricter water quality rules for the fish that you have. Fish are more sensitive to water chemistry issues than turtles are. A slightly acid pH (6.0 to 6.9) will help slow the growth of bacteria and fungi in a turtle tank's water, but it can kill some fish and invertebrates. When keeping fish in your turtle tank, you have to stay within the pH range that the fish need because they're more sensitive to pH and other water chemistry values than turtles are. You also don't want to go lower than 6.0 even in a turtle tank because it can start irritating the turtles' eyes. Also, the beneficial bacteria that live in the filter can't tolerate a pH much lower than 6.0. You can lower the pH in your turtle tank's water by adding driftwood to the tank or by using peat moss in the filter. You'll need to put the peat moss inside of an aquarium media filter bag or make a bag out of something like an old pair of nylon stockings so it doesn't muddy up the water before putting it in the filter. You can raise the pH using an aquarium pH increase additive, ordinary baking soda, or by using crushed coral as a filter medium. If the pH in your tap water is always low, then you can even mix crushed coral into the tank's substrate. It will leach calcium into the water, which will raise the pH and buffer it against future changes. But only do this if your tap water pH is always low. For temporary problems, you're better off using it in the filter. It's easier to change the filter media than the substrate. If you vacuum frequently using a siphon-type vacuum and throw away the water that you siphon off, you may not have to change the water very often (if at all) because you'll be doing a partial water change every time you vacuum. If you drain more than 25 percent (one-quarter) of the water when you vacuum, then that counts as a water change, too. Water changes are easy to do even when you're not vacuuming at the same time. You just use a siphon hose to siphon off some of the water into a bucket and replace it with fresh water (or salt water or brackish water if you're keeping turtles who need those environments). Usually you replace one-quarter of the water with every change if there are no problems, but you may change more of the water (like one-half, or maybe even all of it) if you are doing it to correct a problem. Make sure to turn off your tank heater(s) and let them cool down for a few minutes when doing water changes if the water level will drop below the height of the heater(s). Electric aquarium heaters will instantly burn out if they're operated out of the water. Take my word on this. I've burned out a few over the years by forgetting to turn them off when doing water changes. How often to change the water depends on your setup, the size of the tank, how good a filter you have, how many turtles you have, and many other factors. Basically, when the water starts getting cloudy and smelly; or the nitrate levels get too high, that means you've waited too long to do a water change. Nitrates are the end product of the nitrification cycle, so they have to be removed by changing the water. Most turtle keepers do partial water changes at least twice a month if they have good filters and have no water chemistry problems. If your tank or filter are a bit too small, or if your water chemistry numbers are not good, you may have to do water changes more often. One way to reduce the frequency of water changes is to use live plants in your turtle habitat, as described on this page. Aquatic plants all use nitrates as food, and some of them have quite the appetite for it. Of course, keeping plants in your habitat introduces more complexity, so it may not be something you want to do right at the beginning. But it's something to keep in mind for the future. Turtles have lungs and breathe air like people do, so some keepers don't bother aerating their tanks to put air in the water. But aeration helps keep the water healthy by discouraging the growth of anaerobic bacteria. The word "anaerobic" basically means bacteria that "don't like oxygen," and the "bad" bacteria that we don't want in our turtle tanks are all anaerobic; so by adding air to the water, we make the water less suitable for bad bacteria. An inexpensive aquarium air pump and an air stone will help keep your turtle's water cleaner. It also makes nice bubbles, which some turtles enjoy playing in. Air stones do get clogged up after a while and need to be cleaned or replaced. 8. Move the Water Around. If you have a large turtle tank (which you should if you have large turtles), you can help improve the water quality by moving the water around. If you have a powerful enough external canister filter, you can circulate your water just by placing the outlet end of the tube underwater and using an elbow or spray bar adapter to point the water in a good direction to keep it moving, like in the picture on the right. Another way to keep the water moving is by using an aquarium circulation pump. These pumps basically just move the water in the tank around in whatever direction you point them. It helps maintain a more even temperature throughout the tank. It helps diffuse bacteria and oxygen throughout the tank. Oxygen is necessary for aerobic (good for your habitat) bacteria to thrive. It also discourages the growth of anaerobic (bad for your habitat) bacteria. It helps slow down algae growth a bit. Add a plant or two. As mentioned above, plants help consume nitrates and other pollutants and compete with algae for available carbon dioxide. But adding plants to a turtle habitat has to be done carefully. Some plants are toxic to turtles, and others will just become salad for the turtles. Also, most plants need to be rooted in something, so unless you're using floating plants or plants that can be tied to something like a rock in the tank, you'll have to use a substrate like Flourite. Floating plants like hornwort, of course, are an exception. You don't need substrate for floating plants. Add a few working fish. Some fish, like Otocinclus catfish ("Oto's") and Hypostomus plecostomus ("plecos" or "plecs"), can help keep the water clean by eating algae and scavenging for leftovers on the bottom of the tank. Ghost shrimp are also very good at this, but unless you provide adequate hiding places for them, the turtles will usually eat them before they get to do very much work. Other fish, like Danio sp. ("zebra fish") help by eating scraps that our messy turtles ignore. But working in a turtle tank is a dangerous job for a fish because your turtle may eat them! So unless you're willing to take a chance that your working fish may become turtle food, don't add them to the tank. Be careful about which fish you add: Otos, plecos, and zebra fish are probably the safest. They're also pretty fast swimmers, so they may be able to out-swim your turtles -- for a while, at least -- and avoid becoming lunch. It's important to avoid fish that could injure your turtles, such as armored catfish (unless they're bigger than the turtles can eat). Finally, remember that you must aerate your tank if you're going to introduce fish, or else the fish will suffocate and die. Ghost shrimp are also good scavengers, but they're also a favorite food of turtles. If you want them to survive for very long, you'll need to provide some sort of harborage for them to live in, such as Java moss or some other dense plants on the bottom of the tank. You can also make them a hiding space with flat rocks, but make sure that your turtle can't get stuck under them and drown. 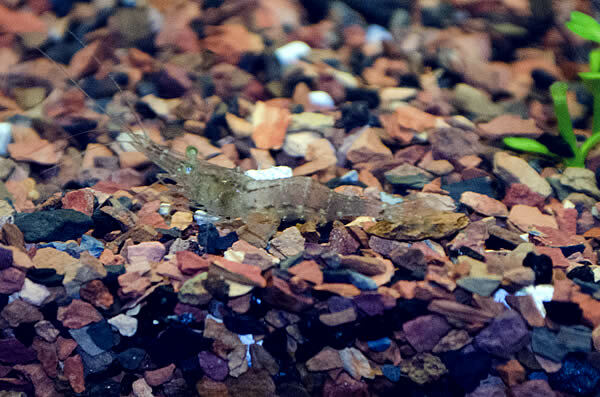 Ghost shrimp are very inexpensive because they are sold as food for larger aquarium fish. If you add them to your turtle habitat, they run a high risk of becoming turtle food eventually. Because the shrimp are nocturnal (active at night) and the turtles are diurnal (active during the day), if your habitat has places for the shrimp to hide during the day, they have at least a fighting chance of surviving. You can learn more about keeping ghost shrimp in a turtle tank here. Ultraviolet Sterilizers. UV sterilizers use ultraviolet light to kill algae, most bacteria, and many viruses, fungi, and parasites that are in the water. The organisms die or are their reproductive capabilities are damaged when they pass by the light. The sterilizers can be placed in the water line to the filter. Some filters, like many of the larger SunSun models, have them built right in to the filters. Sterilizers and clarifiers can help keep your water clear and free of floating algae and can help keep your tank healthy by killing germs that can make your turtles sick and make the water smell bad. They're a good addition, especially for larger tanks. They should not be used during initial water cycling, however, when introducing friendly bacteria supplements, nor for a few days after changing a filter or the media inside a filter. They should be turned off during these times to allow the friendly bacteria to populate or re-populate their substrates. Introduce friendly bacteria. Pet supply stores sell tablets or liquids that can be added to a new fish tank to "condition" the water by removing chlorine, and sometimes chloramine and ammonia. Some of these conditioners also contain starter cultures of beneficial bacteria, and because the same bacteria that help keep fish tanks clean also help keep turtle tanks clean, these additives aren't a horrible idea when setting up a new tank. They're also helpful right after changing the filter media, since you will have just washed a lot of the friendly bacteria down the drain. If you choose to use them when setting up a new tank, add bacteria supplements to the tank at the dosage on the label after it's set up and the filter is running, and not more than a few hours before you introduce the turtles. The bacteria need the turtle wastes or else they will die, so adding them to an empty tank is just a waste of money. In a big tank, you can use a bacteria supplement for fish ponds. This is what I usually do when I set up a new habitat, or add a new filter or change the media in the filter. The pond bacteria is essentially the same stuff as is sold for aquariums, but it's a lot less expensive. Water additives like the various turtle water cleaners contain bacteria and enzymes that help dissolve poo and leftovers so the filter can more easily remove them from the water. Other than bacteria supplements, which are basically the same for fish or turtles, you should only use additives that are specially made for turtle tanks. Some products made for fish can be harmful to turtles. Especially avoid algaecides (chemicals to kill algae). Many of them can kill turtles, other reptiles, and amphibians.